Unfortunately, the Buffalo site did not work out. In a great positive turn of events though, an even more exciting venue has been secured. Rather than requiring teams and fans to relocate near the end of the tournament, the medal games have found a new home in the Carrier Dome on Syracuse University’s Campus. The opening game and ceremony are also going to take place about a mile away at the War Memorial Arena (former home to the NLL’s Syracuse Smash). On Friday, September 18th, the opening ceremony will take place in the War Memorial Arena in the City of Syracuse. Along with that ceremony will be the opening game. This will likely be similar to the opening game in the 2014 World Outdoor Championships in Denver where Canada and the United States played to start things off. I would expect to see the Iroquois Nationals in this game against either Canada or the US. In a 7,000 seat arena, this game should sell plenty of tickets and be a great atmosphere. It would be symbolic if the Iroquois Nationals played the US as this was also site of the inaugural Bowhunter Cup game, played in September of 2010 where to US won in a close game 13-11. The Nationals have won every game between the two countries since. The vast majority of games will be played just south of Syracuse in the Onondaga Nation Arena (Tsha’Hon’nonyen’dakhwa’). This is a small 3,000 seat arena, but it is still relatively new and excellent for an event such as this. The Onondaga Redhawks play here during the summer Can-Am schedule and regularly draw very good crowds. Tickets for games featuring the US, Iroquois, or Canada will be extremely popular, but I wouldn’t expect it to be empty for anyone else either. There is no bad seat in the house and it keeps you right next to the action. Also under works is another box arena being built by the Onondagas. This was only announced about a month ago, but they are hoping to have it built in time for the World Games. Gahόñhsӓ’, as it will be known, will have seats for 300 fans and is lacrosse specific. While this could in theory house some of the other games, more than likely it will be used as a practice facility for teams during the Games. It will be interesting to see how this facility evolves as September approaches. The big games are now set for the Carrier Dome. The Dome has long been established as a premier venue for lacrosse. It is home to the NCAA’s Syracuse Orange, where they are regularly a leader in attendance. In fact, the Dome record for a regular season game is 18,458 in 1990 and 20,007 for an NCAA game against Cornell in 1988. Documenting Syracuse as an area with lacrosse fan base though would take much more than just this article. What really makes this location exciting is the fact that it is in the Carrier Dome. The above numbers are all for field lacrosse, but we’re talking about box. Transforming the Carrier Dome into a box lacrosse arena changes the entire feel of the place. The configuration to be used is similar to how Syracuse sets up the Dome for their basketball teams, who again are regularly in the running for national attendance records. For two years in a row, they have sold 35,446 tickets to the Syracuse/Duke basketball game. Simply put, Syracuse knows how to pack people into the Dome. The goal for the WILC is to sell 28,000 tickets. That should be more than attainable. 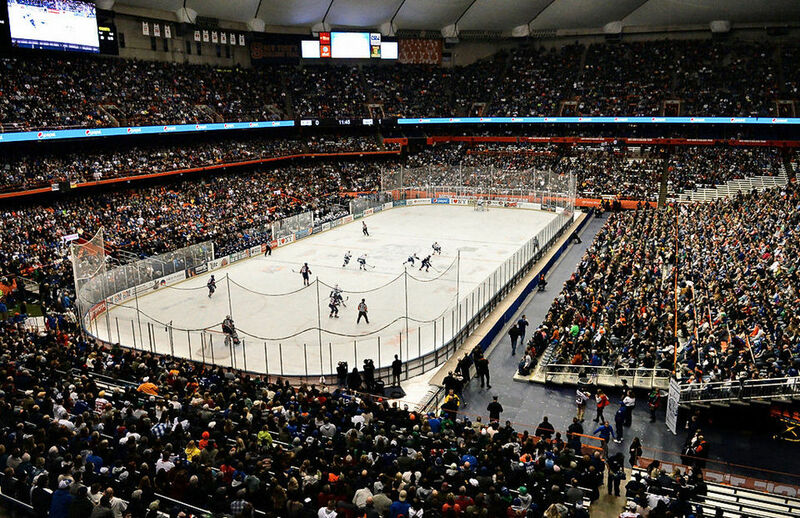 This photo was taken from a Syracuse Crunch (AHL) game hosted in the Carrier Dome in November of 2014. This game set a record of 30,715 fans watching an indoor professional hockey game in the United States, according to a syracuse.com report. By comparison, the Crunch’s average attendance this season was 5,992. This is likely a once in a lifetime type of opportunity for box lacrosse fans and shows that the area can support big events like this. As mentioned before, Syracuse’s lacrosse history is very rich. An added benefit though is Syracuse is going through a new, concentrated effort to improve the city for tourism. New hotels are being built, older ones remodeled, the University is trying to tie themselves into the city more, and attractions are being improved. This is great timing for an event like this to come to the area. The big question is how to attract fans, especially the box lacrosse hungry fans in Canada. Oddly enough, there is already a pipeline of Canadians regularly coming to the area. The main draw here is the Destiny USA mall, one of the largest in the country. The mall has gone through a major expansion over the past few years, and is adding new stores and restaurants constantly. According to a syracuse.com report, it is estimated that nearly 25 percent of the mall visitors are from Canada already. More than anything, this suggests that if the trip is worthwhile for a shopping trip, more than a few people will also travel to see their national sport on the international stage. What can really draw area fans in will be how much of the local talent winds up on the floor. While no Syracuse players will be on Canada’s team based on their recent announcement, the US, Iroquois and even Ireland are slightly different. Ireland has announced that Syracuse grad Stephen Keogh will be one of the leaders for their team. The Iroquois could feature other Syracuse players like Cody Jamieson, Jeremy Thompson, Sid Smith, Brett Bucktooth, Randy Staats, and Warren Hill. They of course will probably have several others from the area like current NLL players Bill O’Brien, Miles Thompson, and Jerome Thompson, in addition to NCAA superstar Lyle Thompson. The drawing power of Lyle alone will be massive. The US team is really who will feature the most local talent. Their 46 player tryout roster featured six former Orange laxers, two from nearby Cornell, and another nine from various upstate New York towns. If Casey Powell winds up on the team as is expected, he alone could draw plenty of fans out of the woodwork. With the right press and promotion, this event could sell out across all venues. This is a world class event being hosted by a nation who has lacrosse as a central part of their culture in an area that loves the sport. The city as a whole is on the upswing. Box lacrosse is growing at a rapid pace, which will lead to some great competition from all countries participating. I would mark these dates on your calendar and get ready to go see the best box lacrosse in the world with your own eyes!